It’s good to talk – and Bairns chief has it down to a tea! Craig Campbell’s door is open to anyone who wants to talk all things Falkirk. A big sack of teabags – gifted to Campbell by club sponsor Gordon Profit – sits in the corner of his office for use when fans come in to discuss the club, offer input or opinions. 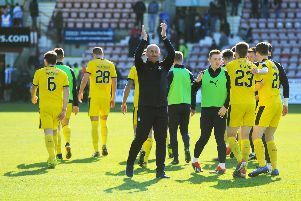 The Falkirk Herald did just that this week – to discuss the first three months at the helm for the Bairns’ chief executive. His aims are pretty similar to the fans he hopes to meet for a cuppa when he says “I want Falkirk to be better”. He has drawn up a ten section plan of how the club operates and how, by working cohesively, it can be restored to the Premiership. 02-09-2017. Picture Michael Gillen. IRELAND. Sligo. Mooney's Bar. Falkirk fans ahead of Sligo Rovers v Falkirk game with Flakirk directors Lex Miller; Craig Campbell, Chief Executive; Martin Ritchie and Margaret Lang, chairman. “Compared to others we have a great set-up. Everyone is here, in the stadium, in the town and we have a good atmosphere here. “When I go into a workplace I spend three months assessing, meeting people, getting feet under the desk then create a plan – that began last week. I don’t think it is a major overhaul I’m doing here – it’s just a change of mindset – I want Falkirk to be better. That’s what everyone wants from the fans throughout the club. In that he means how the Bairns do things, how they recruit players, the expectation of the academy structure, how the club performs on match days – on the pitch and off it. And doing it with a positive, progressive ‘Premiership’ mentality. To do that, he’s willing to talk. To current investors, new investors and fans. He’ll go over his plan, the various workstreams within it, all that leads the Bairns back to the Premiership, and with the ability to stay there. He’s hoping for talks with the club’s major shareholders in coming months. “The board gets it from the fans about investment but it’s my job to find ways for where that investment can come from. When we’re in the Championship we have a Championship playing budget. And the fans he speaks to could well be involved. He’s already discussed how the club operates with some, and had feedback and opinions from others, all over a cup of tea. Next up it’s some of the powerbrokers at the club – but fans could get a look in too. “I will be meeting with the major shareholders group soon about their ambitions and hope we can come up with some proposals for increased fan involvement. It’s something to explore. “A club isn’t just a board, or a manager. If there are people to contribute to strategically running this club I’d more than welcome that. From individual work level to board level, if there are ways of making fresh investment. Maybe that is greater shareholding through the support bases and widening the shareholding. The plan set out and to be implemented over the next few months looks sound in structure and theory. It will give Campbell a lot of work in the weeks he splits between the community foundation and the club itself. But it is his work in the Foundation down the corridor that allows him to turn his hand to improving the club further. “We have good people at the Foundation, we have recruited well and now have a solid group. That’s what it’s all about. My role there now is a guiding hand to steer them, they do the work and are very good at it and are successful. “It needed sorted out when I came in, it wasn’t performing as it should, now it’s thriving and it’s the people there who have done that. They’re the ones working it day-to-day and I am there as a guide to head it up. A lot of parents involved with the Foundation are also supporters of this club. I’d hope they will have seen changes in the Foundation for the positive and think we are all moving in the right direction. “The club has been outside the Premier League for 36 of the past 48 years. For the size of this club, that’s an underperformance - no secret. “We need to get up, need to maintain. I’m convinced we can match the expectations. “There are ten work streams to be done, all cohesive. It’s a lot of work but that’s what I am – and what we are all – here for. “Now the club has a new chairman in Margaret Lang, with strong opinions. We have got a strong chairman, a strong CEO, and a really good staff team here, a strong management and coaching staff.